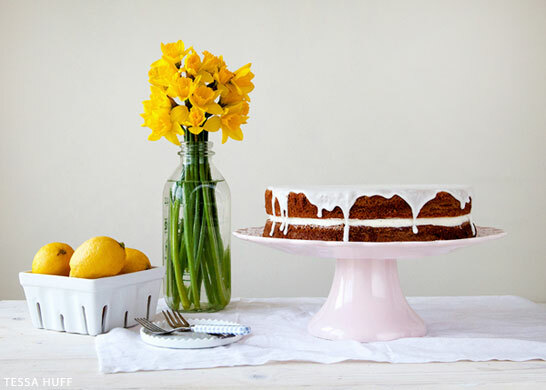 Our contributor, Tessa Huff, is sharing a bright new cake recipe…. You don’t always need a reason to eat a slice of cake. 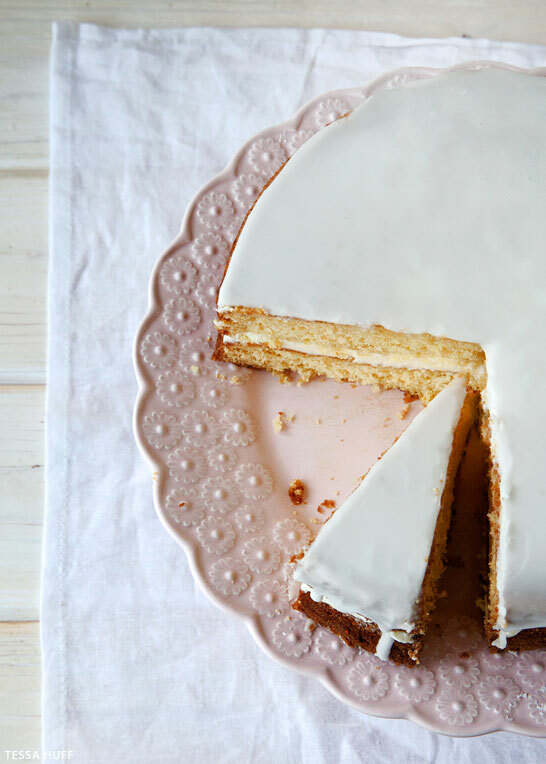 Sometimes a delightful, simple cake is all you need to turn an ordinary afternoon into a little celebration. While many cake recipes are dripping with sprinkles and drowning in caramel and chocolate, sometimes less really is more. With fresh, clean flavors, this cake is the kind of cake to enjoy any day. 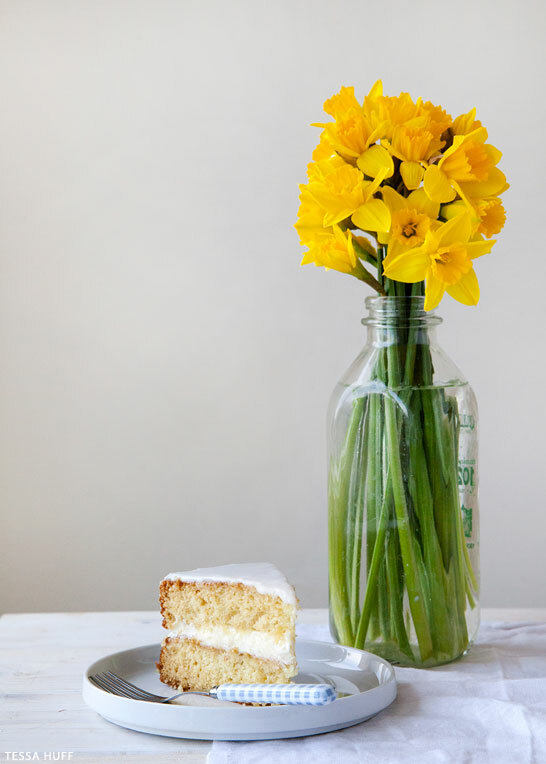 Now that we are in full-fledge Spring mode, I’ve been so inspired by fresh-cut flowers and refreshing flavors. The breeze is getting warmer and the days are already getting longer. 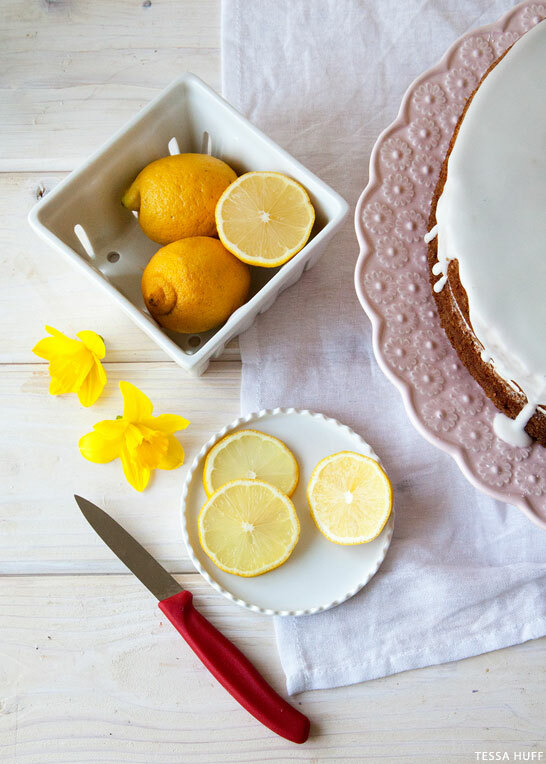 I wanted to create a light and fresh cake to enjoy on warm, spring afternoons, and this Lemon and Lavender Buttermilk Cake might just be what sunshine tastes like. 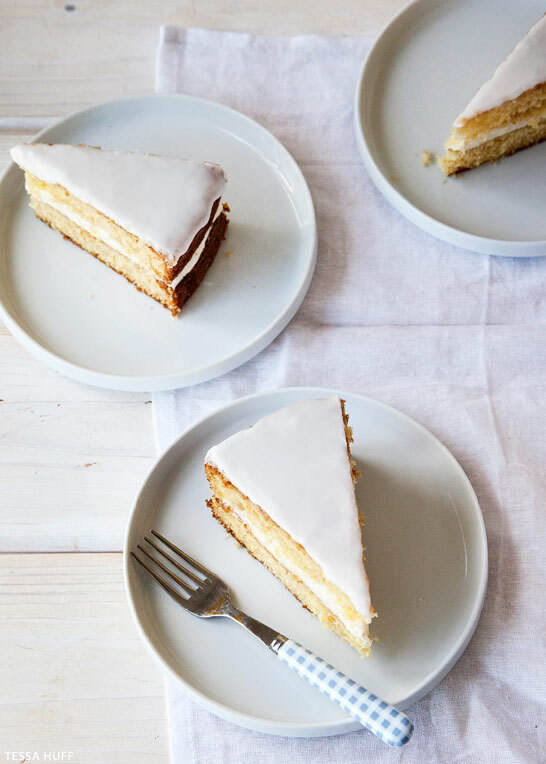 This lemony, buttermilk cake is very light and fluffy. With a crumb so delicate, I wanted to pair it with fillings and frostings that would not weigh it down. I gave the cake layers themselves a nice soak with lavender simple syrup before layering them with silky, lavender buttercream. 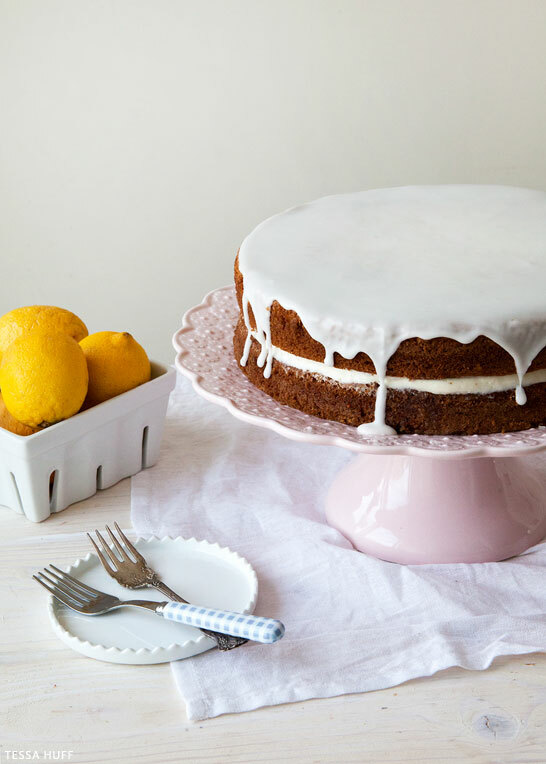 Instead of a heavy frosting, a sweet, lemon glaze was all this cake needed. This is the type of cake I imagine snacking on while chatting with friends over tea on a sunny afternoon. Preheat oven to 350 degrees. Prepare two 9 or 10 inch pans and set aside. Sift together the dry ingredients and set aside. In the bowl of an electric mixer, beat the butter on medium speed with a paddle attachment. Add in the sugar and beat until light and fluffy. Turn the mixer to low and add in the zest, vanilla, and eggs – one at a time. In alternating batches with the mixer on low, add in the dry ingredients and the buttermilk – beginning and ending with the dry ingredients. Mix until combined. Evenly distribute the batter between the cake pans and bake for 22-24 minutes, or until done. Add all of the ingredients into a medium-small saucepan. Heat over medium-high until syrup begins to boil. Reduce heat to low and cook until mixture reduces to a syrup (about 10 minutes). Strain out lavender and set aside. Reserve 1/4 of syrup for buttercream. Place egg whites and sugar in the bowl of an electric mixer. Gently whisk to combine. Fill a medium saucepan with a couple inches of water and place over medium heat. Place mixing bowl on top of the saucepan to create a double boiler. While whisking, heat until the egg mixture reaches 160 degrees on a candy thermometer. Once hot, carefully transfer the bowl back to the mixer fitted with a whisk attachment. Beat the egg/sugar mixture on high for about 7 to 10 minutes, or until the outside of the bowl returns to room temperature and the meringue holds stiff peaks. Stop the mixer and swap the whisk for the paddle attachment. With the mixer on medium-low, add in the butter a couple tablespoons at a time. Add in the vanilla extract and lavender simple syrup. Turn mixer up to medium-high and beat until silky smooth. Stir in the lemon juice into the sugar. Add in the milk until sugar is dissolved and desired consistency in achieved. Brush the tops of both cakes with the lavender simple syrup. Spread buttercream on top of the first cake layer and top with the second layer, upside down. 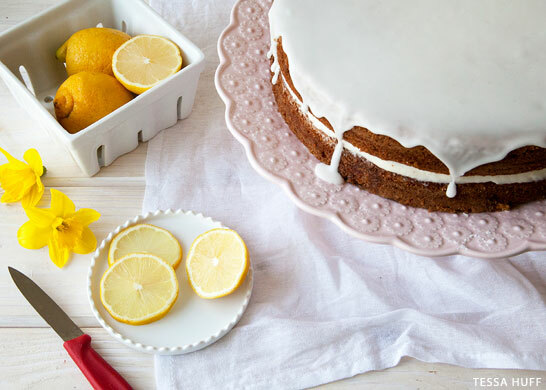 Gently spread lemon glaze over the top of the cake and let drip over the edges, if desired. « Write for The Cake Blog! Less is definitely more with this beauty. The taste as well as the aroma must be amazing! What a beauty! And I can imagine myself snacking on a piece of this while chatting with friends over tea on a sunny afternoon as well. Sounds perfect! I’ve done it in a cupcake format and it was delicious. Tanks for the recipe. I just made this for a wedding and it was wonderful! Thanks for the recipe!! This sounded so good I had to make it. My buttercream filling is pretty runny. Any suggestions on how to thicken it?? Try mixing it longer, giving the butter plenty of time to emulsify with the meringue that you created in step 2. I made this cake for my boyfriends mother’s birthday. I was so excited to try a lavender infused cake and this one looked so pretty. Unfortunately, this recipe did not deliver. The method of infusing the cake with lavender simple syrup only served to over sweeten the cake while not delivering any lavender flavor or aroma whatsoever. This didn’t surprise me all that much, but what did surprise me was that the buttercream frosting also had no trace of lavender. 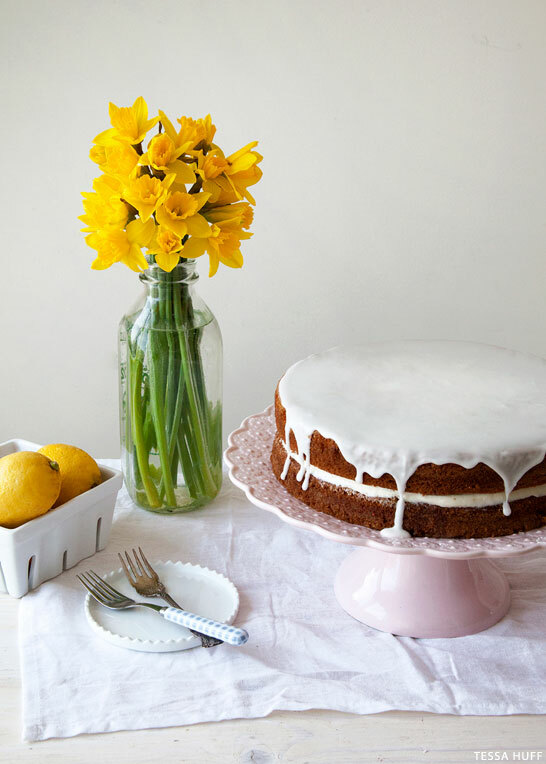 If you want a beautifully light and aromatic lavender cake, this is not the recipe for you! If you want an overly sweet, heavy buttercream filled cake, this is for you! Very disappointed and will probably never use this site again. Recipe sounded amazing, ingredients smelled wonderful…but, after 25 minutes, even though a toothpick came out clean, the cake collapsed as soon as it was turned out and was visibly raw on the bottom. The lavender buttercream was was so thin it wouldn’t coat the back of a spoon. I checked the recipe three time to make sure I hadn’t missed an ingredient I started the entire buttercream from scratch-same result. After several minutes with the mixer, it hadn’t thickened at all. I needed a heavy dose of pure cream and arrowroot to get something spreadable. I also agree with Mina that the buttercream is too sweet, anyway. Lemon Lavender Buttermilk cake seems to be very simple to make.Will try this at home and let you know how well it worked! I had high hopes for this cake, but came away disappointed. It’s a decent tasting lemon cake, but nobody who sampled it at my house could taste the lavender, even though I added extra to the simple syrup, in an effort to get more concentrated flavor. I didn’t have any problem with consistency of the buttercream or glazes, but found it to be a lot more trouble than it was worth. I also agree with others who felt that it’s too sweet. Next time I’ll just use the lemon cake recipe for cupcakes & skip the lavender all together. Hey there! Wow – I am surprised to read all these recipe failures. My boyfriend and I made this cake today for a friend’s birthday and it came out BEAUTIFULLY. The cake itself was light and fluffy, and not super sweet. I used dried lavender buds from last summer’s farmer’s market to make the simple syrup (used about two fluffy tablespoons) and it was so lavender tasting and lovely – we used it in gin and tonics later! Buttercream frosting was velvety with a wonderful mouthfeel and the lemon glaze the perfect topping. My guess is all these failures was due to technique execution – we were very careful not to over mix the cake batter and mixed in the butter in chunks, very slowly to allow it to emulsify in a stand mixer. We didn’t use time to make sure the cake was ready – we tested the temperature to make sure it was 165*F and used a cake tester as well. Also made sure to incorporated cold ingredients at room temperature (like the buttermilk, eggs, etc). Made this for my daughter’s birthday. The flavors were amazing, although I did add a little lemon juice to the cake batter. In the future I will make this a 3-layer cake, as I think 2 makes the pans a little too full to bake evenly. Roughly 12 to 15 servings, depending on how big of slice you cut. Enjoy! When writing the recipe it might be a good idea to say sift all the dry ingredients except for the sugar then set aside. You have in the first instructions to sift all the dry ingredients together which includes sugar, but in the second instruction line you then say add the sugar, but sugar is a dry ingredient and have already sifted it with the other flour and dry ingredients! Does not make any sense!